The Mikoyan-Gurevich MiG-21 (Russian: Микоян и Гуревич МиГ-21) (NATO reporting name "Fishbed") is a supersonic jet fighter aircraft, designed and built by the Mikoyan-Gurevich Design Bureau in the Soviet Union. It was popularly nicknamed "balalaika", from the aircraft's planform-view resemblance to the Russian stringed musical instrument or ołówek (English: pencil) by Polish pilots due to the shape of its fuselage. Early versions are considered second-generation jet fighters, while later versions are considered to be third-generation jet fighters. Some 50 countries over four continents have flown the MiG-21, and it still serves many nations a half-century after its maiden flight. The fighter made aviation records. At least by name, it is the most produced supersonic jet aircraft in aviation history, the most produced combat aircraft since the Korean War, and it had the longest production run of a combat aircraft (1959 to 1985 over all variants). The MiG-21PF was the production version of the all-weather interceptor. These were powered by the R11F2-300 turbojet and, starting with the seventh production batch, fitted with the RP-21 radar (the first six batches used the older TsD-30T radar (aka RP-9-21). Further, the weapons control system was modified from that of the F-13 to allow use of the RS-2US (aka K-5MS) beam-riding AAM in addition to the IR-seeking K-13. Export (Third world) model of the MiG-21PF was the MiG-21FL. Downgraded from baseline MiG-21PF with older and less powerful R11F-300 engine, no provision for carrying RS-2US beam-riding missiles and a simplified, downgraded version of the RP-21 radar, designated R1L. Wide-chord fin and brake chute fairing at its base. Built under license in India as the Type 77. India received its first MiG-21s in 1963, numbering 8 MiG-21F-13s. Two more F-13s and two MiG-21PF were received in 1964. The MiG-21FL was designed by Mikoyan to fulfill an Indian requirement, and this was the first version to be licence-built in India by HAL. The first 54 of these were built and test-flown in the USSR, then dismantled and shipped to India for reassembly; the first one built completely from scratch in India was handed over to the IAF in October 1970. All told, 205 MiG-21FL were built in India, of which 196 were built entirely in India; the last MiG-21FLs were retired in 2005. While certainly not the first MiG-21 kits to be produced, Fujimi's efforts were the first to use engraved panel lines and modular construction to allow for a variety of variations to be done with the same basic molds. In this case, the fuselage, cockpit tailplanes and wings were common to all of Fujimi's Fishbed kits. Where Fujimi ran afoul was in the designation of the kits. For instance, all the MiG-21MFs were actually MiG-21bis versions as Fujimi did not take into account all the nuances between the versions. The same is somewhat true for this particular kit in that they offer it as a MiG-21PF when it is actually an FL version. However, one does have to give them credit for trying and the vast majority of modelers in 1991 were unaware of the subtle differences in versions. Thanks to 25 years of research we as a modeling community are much more aware of these things. So this kit can be built as a later PF or as the FL as produced by Hindustan. It comes with a proper thinner spine and the broad fin of the FL or later PF. Cockpit is a bit Spartan by today's standards, but still nicely done with seat, stick and a proper instrument panel. This latter item is molded in clear plastic for those with good eyesight who want to paint around the instruments. It also has a decal that can be used. Keep in mind that these planes had that blue-green interior paint. A pilot figure is also included. One will need nose weight with this and there is room forward of the cockpit for the 5 grams recommended. Before closing the fuselage halves, one will need to add the nose gear well, tailpipe assembly and open the holes for the centerline tank or gun pod. Wings have separate flaps and ailerons, but these were rarely deflected on the ground. There is little or no wheel well detail, but eh landing gear are nicely done with the nose gear including a separate wheel. Any external fuselage air scoops are separate and will need to be added. Note that this version only has a single wing pylon and that is just for the missile. There is a rear air brake that can be posed in the lowered position. The forward fuselage brakes are molded shut. These MiGs were interceptors and as such did not carry bombs. The kit provides a centerline fuel tank or one can use a gun pod in its place as the airframe did not have one built in. Interestingly, one will have to trim the forward vanes on the missiles as the aft section is too square. Instructions are well done with Gunze references. There are no fewer than seven markings options, most of them with the Indian Air Force. Interestingly, two of these seven are listed as an MF, which means you cannot use them on this aircraft as the fuselage spine is too narrow. Both of those options are camouflaged. 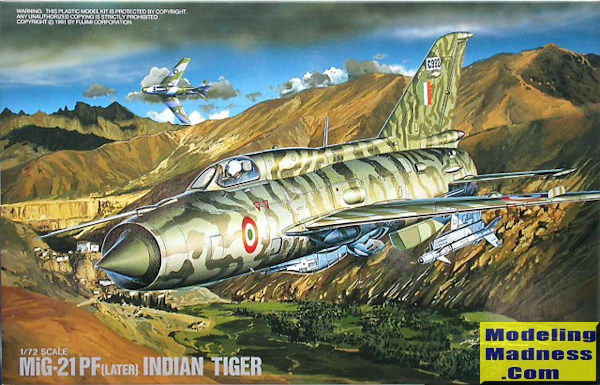 The others include two unpainted metal aircraft, the tiger striped plane as shown on the box art and another option similarly camouflaged as the two MFs. It is interesting that the Indian AF PFs are properly identified as FLs in the markings diagram. One other option is an Egyptian PF with the 'Nile' camouflage scheme. The decal sheet is nicely printed and the roundels are the proper color. Might want to save the spare roundels for other IAF projects as often decal makers get the saffron wrong. While the Fujimi kit may not be the most accurate around, it is not all that bad and is a pretty easy build as these things go. Newer kits are probably more difficult to build and locating a Fujimi version could be difficult. However, it will result in a very nice model.